In this exclusive interview, developer Buzz Monkey Software admits paying homage to Nintendo's GameCube adventure. If you frequent the App Store, odds are good you came across Chillingo's outstanding puzzle/platform game, Rinth Island. 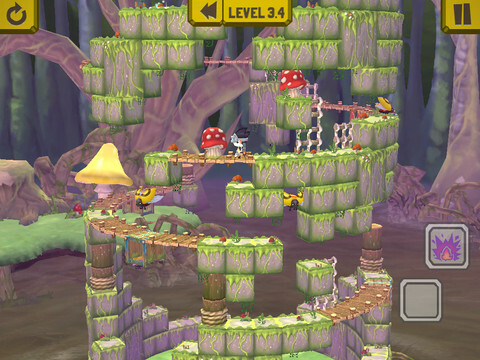 Developed by Oregon-based Buzz Monkey Software, this gem tasks players with navigating through 60 different towers to reach strategically placed objects, plotting several moves ahead to find the best possible solutions. Then, after they complete the first batch of stages, gamers can hop into the editor to create their own, eventually sharing them with the rest of the world. Quite frankly, we love this game, and couldn't resist the opportunity to speak to Buzz Monkey's Development Director Jon Milnes about not only Rinth Island, but also the team's inspiration. It was no surprise that a certain Nintendo game had an impact. 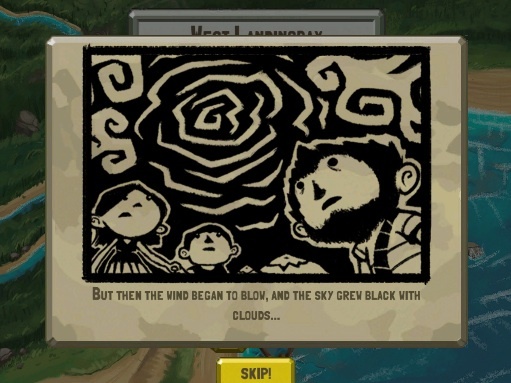 The intro's artwork reminded us of The Legend of Zelda: The Wind Waker. Were you inspired by Nintendo's adventure in creating those charcoal slides? Definitely, the look of Rinth Island was inspired by The Wind Waker, Castle Crashers and Zack and Wiki, just to name a few. We have some huge Zelda: The Wind Waker fans at Buzz Monkey, and felt the rough charcoal slides were a fun and interesting way to tell the story of Gimble and Libby's adventure. We don't see too many puzzle platform games these days. Because of this, Rinth Island felt refreshing. How did you come up with this concept? Did other games influence you? This game concept is actually many years in the making, and was originally inspired by gaming puzzlers like Nebulus, Fire 'n' Ice and Adventures of Lolo, all of which are late 80s, early 90s classics. We looked back to games that were major successes in the genre, even if they didn't really get the attention they deserved. Those games taught us a bunch of lessons about how to make a puzzle adventure feel challenging, interesting and fun, and we hope our players feel that way about Rinth Island. The level editor is quite intuitive and a great addition to the experience. Did you plan to include that from the beginning, and how does its inclusion enhance the overall package? Has the community responded? The level editor was always planned to be included in the shipped version from the earliest stages. One of the primary reasons for this goal is that if we could make an editor that was extremely easy and intuitive to use, it would make creating levels easier for us as well as the end user. We use the same editor to create the levels as we provided to the community. And now we get to watch as the community grows and creates levels we never imagined. Hundreds of new levels are being created by the community every day. We noticed the game restricts us from having a "free look" at the tower before making a move. Is this something you could implement in a future update? Just a means to drag a finger around the screen and survey our surroundings would be a huge help. We have plans to include this feature in the near future. It is integral to another system that we'll be introducing. We think you'll enjoy it. We've heard rumors of Apple designing a physical controller to use with iOS games. What do you think of this? Would consumers buy it? Some of us wish iOS devices came with a d-pad by default. More control options mean more gaming possibilities on mobile devices. The more options the consumer is given, the more space opens up for us to design awesome, unique games. What can we expect from Rinth Island future updates? We have two updates coming soon with 30 more adventure levels each, more pets, more costumes, more themes and some awesome new mechanics to take advantage of the cylindrical gameplay. Great to hear. We can't wait.